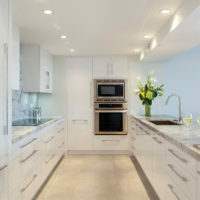 The Place For Kitchens and Baths is pleased to present this newly completed contemporary kitchen. This project was both a challenge and joy to undertake. 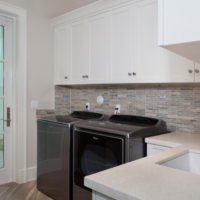 This kitchen basks in and complements the oceanfront views. 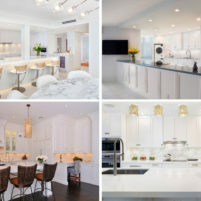 The white floor, white countertops and white backsplash all had to work with each other in perfect harmony in order to achieve its clean and crisp look. 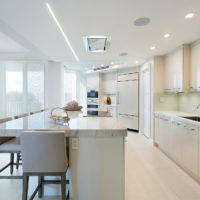 Among this kitchen’s luxurious features are a gorgeous range hood and cooktop, beautifully illuminated recessed ceilings, and stunning high-gloss surfaces. I am particularly proud of this job. The client was so thrilled with the completed result, she contacted us as soon as she had lunch in it and enthusiastically told us how much she adores it! If you are considering remodeling your kitchen or bathroom, you should set up an appointment to visit our showroom. 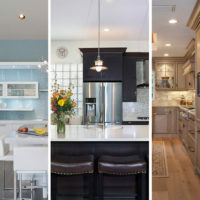 Let us help you realize the perfect kitchen or bath for your home.